Kentucky based country music duo Twang and Round have announced the dates for their upcoming headlining tour throughout October. The group will hit the road in support of their recently released new studio album “Way I Was Raised”, which was released via Thirteen Skulls Entertainment. 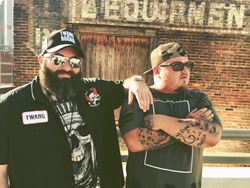 Twang and Round will be crisscrossing the country performing their unique brand of AmeriFlow for fans, including a performance at the Chillin on the Lucie Country Music Festival. Coloring outside the lines of any genre-specific formula takes courage, Twang and Round's musical palette is much more refined, which allows them to speak the AmeriFlow genre. The group can go from blasting the likes of Creedence Clearwater, The Black Crowes, and Lynyrd Skynyrd one minute, to seamlessly mixing in UGK, OutKast, and Beastie Boys the next. All of these elements come together to give Twang and Round an authentic signature sound that bridges the gaps between country and hip-hop. Twang and Round recently signed a long-term deal with Thirteen Skulls Entertainment and debuted the brand new album “Way I Was Raised.” Thirteen Skulls Entertainment was founded by music industry veteran Ron A. Spaulding and Major League Baseball Hall of Famer Frank Thomas and boasts an exclusive partnership with AMPED Distribution/Alliance Entertainment. Thirteen Skulls Entertainment focuses on a new genre entitled “AmeriFlow,” which is a musical hybrid of country, rap, and rock. The label provides a full range of services in the fast-changing music business and offers artists home with the necessary tools to nurture and incubate creativity without constraints. With the focus on creating AUTHENTIC music, Thirteen Skulls Entertainment's legacy is defined by creativity and uncompromising commitment to artistry.